Simultaneously holding together multiple starting points or differing perspectives is well embedded within Christian theological reflection. All the way back to the discussions concerning the Trinity, there was a shared vision, even amongst those who disagreed in the eventual formulation, that God is both three and one—two seemingly contradictory notions that form the most foundational confession of Christian thought. In a sense, the council of Nicea held together what Penchansky revels in separating. These saints had a prescient instinct that out of contradiction truth could arise. The very nature of theology itself is a carefully controlled exercise in holding together a constellation of paradoxical confessions. Penchansky could learn a great deal from this. Instead of seeing the two responses of "Fear God/Get Wisdom" as irreconcilable, he might recognize how they can be seen to work in concert. A holistic view of biblical wisdom literature teaches that humans must simultaneously depend upon God and use their common sense and accrued wisdom. Life presents a diversity of situations, emotions, struggles, and joys, and so it is no wonder that the sages and prophets present diverse messages. Yet, the Old Testament is not the only part of the Bible that presents differing perspectives. The New Testament does so as well. This is particularly curious because if, as Penchansky claims, the tradents had an interest in steamrolling their faith into a flat harmonization, why would religious communities not only continue to preserve different voices within the Old Testament but also inscripturate new ones? For instance, what response should we have when Jesus himself gives divergent commands? Should we set "Love your enemy and pray for those who persecute you" (Matt. 5:44) as a warring faction against "If anyone will not welcome you or listen to your message shake the dust from your feet as you leave that house or that town" (Matt. 10:14)? Are these two responses irreconcilable? Should we choose one or the other based on our answer to the question "Which Jesus do we want to be our teacher?" "I choose Pessimistic Qoheleth …. He makes problematic the question of meaning; by that I mean that he takes these question out of dogmatic categories and thus disturbs settled opinion. He slips in his own position, forcefully, but allows other voices to be heard. Its author speaks in anguish about the intractable mystery of existence." 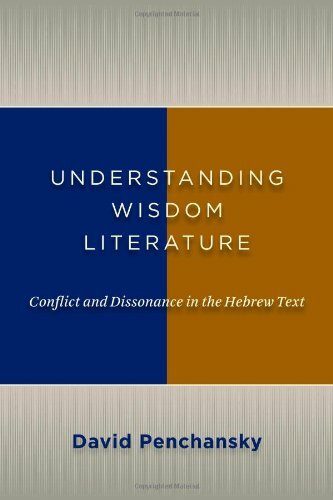 Penchansky helpfully identifies dissonance as a major interpretive key for understanding wisdom literature. But, when he encounters it he opts for the simpler path of selecting the one voice that he most desires, instead of the more difficult task of holding them together. In this way he deviates quite sharply from the visions of life contained within the literature that he seeks to understand. Charles Halton is assistant professor in theology at Houston Baptist University. He writes regularly about biblical studies at awilum.com.